Wet weather is on the way for Colorado as our first Spring storm swirls across the state. DENVER — Wet weather is on the way for Colorado as our first Spring storm swirls across the state. A mild and moist Pacific storm system is moving into Colorado. This storm will drop wet, heavy snow over the mountains and bring rain and thunder to Denver and the eastern plains later today. The Central and Southwest Mountains will have the heaviest snow and a Winter Storm Warning is in effect for the San Juan and La Garita Mountains of southwestern Colorado for up to a foot of snow. Thunder and lightning can be expected with the snow, so be careful outdoors - it truly is Springtime in the Rockies! In the mountains, expect a little "graupel" - soft hail that looks like "dippin' dots"! Denver and the eastern plains will have cloudy skies with a good chance for showers and thunderstorms this afternoon. Temperatures will stay mild this morning - in the mid-to upper 30s for lower elevations and 20s in the mountains. Although severe thunderstorms are not likely, there may be a few strong storms developing over eastern Colorado Friday afternoon. These storms will produce heavy rain, small hail and intense lightning. As the storm system spins to the east of Colorado tonight, there may be enough cooler air on the backside of the storm to change to rain over to a mix of snow for the Denver area early Saturday. At this point, it appears most of the moisture will come down in liquid form for Denver and vicinity, but do not be surprised to wake to some snow early Saturday. Saturday will be a partly to mostly cloudy day with scattered snow showers in the mountains and a slight chance for rain showers over the plains. Highs will be in the upper 30s to low 40s in the mountains and in the 50s for lower elevations. Another minor storm system will move over Colorado on Sunday with snow showers for the mountains and scattered afternoon thunderstorms for Denver and the eastern plains. Highs will be in the upper 30s to low 40s in the mountains and 50s for the plains. 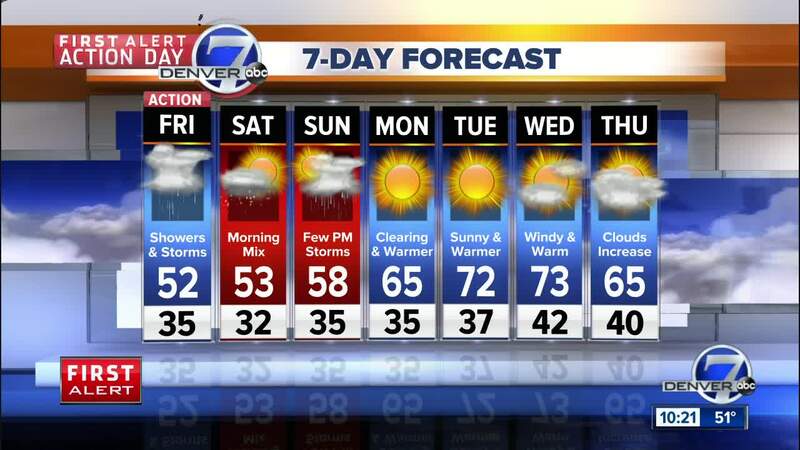 By Monday, warmer and drier weather will return to Colorado. Highs will bounce back to the middle 60s in Denver with 40s to low 50s in the mountains. Tuesday and Wednesday will be even warmer with highs soaring into the 70s over eastern Colorado! Late next week will turn cold and stormy again with a chance for rain and snow next Friday.